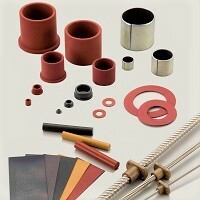 Sliding bearings are bearings where only sliding friction is generated. The shaft is generally supported by the sliding surface, with oil and air in between to facilitate sliding movement. 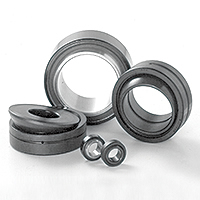 Sliding bearings are lightweight and have a long operating life while introducing minimal vibrations or noise. Sliding bearings made of resin material for slippery surfaces or shafts, that are suited to a wide range of fields and machine components with their lighter weight, lower cost and versatility compared to metal. They are lightweight and generate less vibration and noise, and have a lower slip friction coefficient. They also exhibit excellent plastic workability and electrical insulation when heated, and are water and chemical-resistant. 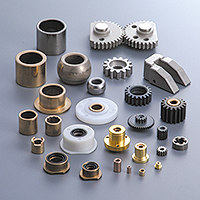 Bearings with an oil-impregnated porous sintered body composed mainly of metal powder. Oil is impregnated into the pores of the bearing itself, resulting in efficient lubrication within the bearing during operation. Self-aligning bearings with sliding spherical surfaces that can support radial loads or axial loads in both directions. Ideal for vibrating or aligning movement, and widely used in construction machinery and industrial machinery.